Petar II Delyan (reigned 1040 – 1041) (Bulgarian: Петър II Делян) was the leader of an uprising against Byzantine rule in the Theme of Bulgaria during the summer of 1040. He was proclaimed Tsar of Bulgaria, as Samuel's grandson in Belgrade. His original name may have been simply Delyan, in which case he assumed the name Petar II upon his accession, commemorating the sainted Emperor Petar I (Petăr I), who had died in 970. The year of his birth is uncertain, but probably not long after 1000, and before 1014. He probably died in 1041. His origin is not clear. He claimed that he was son of Emperor Gavril Radomir and grandson of Samuel of Bulgaria, but he could also be a local who became leader of the uprising and claimed to be Samuel's grandson to justify his proclamation as Tsar of Bulgaria. Those who believe he actually was Radomir's son, think that he was born from Radomir's marriage with Marguerite, sister of King Stephen I of Hungary (996/997). Peter's mother was expelled while pregnant from the Samuel's court before the accession of Gavril Radomir, but given Delyan's subsequent career, it is likely that he had been born and remained in Bulgaria with his father. After Ivan Vladislav's murder of Gavril Radomir in 1015 and the conquest of Bulgaria by the Byzantine Empire in 1018, Delyan was taken captive to Constantinople and became a servant of an unidentified member of the Byzantine aristocracy. He later escaped and went to his mother's country of Hungary, whence he returned to Bulgaria and raised a revolt against the Byzantine rule, taking advantage of the discontent over the imposition of taxes in coin by the Byzantine government. Those who oppose the theory that he was Samuel's grandson and believe he was merely a local Bulgarian claim that he was proclaimed as tsar in Belgrade not because it was the first border town between the Byzantine Empire and Hungary that he reached when he joined them as a prince of royal blood, but merely because it was the first important town that the rebels captured. They also claim that it is highly unlikely that Ivan Vladislav who in 1015 murdered his cousin Gavril Radomir (Delyan's supposed father) and his current wife Maria to seize the throne would not kill Radomir's son and heirs, if he had them, in order to secure himself. It is known that he also ordered the execution of the Serbian prince of Duklja, Jovan Vladimir, who was Samuel's son-in-law (married to his daughter Theodora-Kosara), because Vladimir was a threat to his position as Bulgarian tsar. The uprising spread and rebels very quickly took control over the northern part of Pomoravlje and liberated Belgrade. 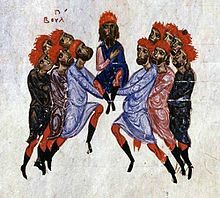 Delyan was proclaimed emperor (Tsar) of Bulgaria there and took the name Petar II after being raised atop a shield by leaders of the resistance. He had been proclaimed legitimate as the grandson of Samuel. He perhaps enjoyed some support from the Kingdom of Hungary. Peter II Delyan took Niš and Skopje, first co-opting and then eliminating another potential leader in the person of one Tihomir, who had led a rebellion in the region of Dyrrhachium. After this Petar II marched on Thessalonica, where the Byzantine Emperor Michael IV was staying. Defeated, he fled, leaving his treasury to a certain Michael Ivač. The latter, who was probably a son of Ivač, a general under Samuel of Bulgaria, promptly turned over the bulk of the treasury to Peter outside the city. Thessalonica remained in Byzantine hands, but Macedonia, Dyrrachium, and parts of northern Greece were taken by Petar II's forces. This inspired further Slavic revolts against Byzantine rule in Epirus and Albania. Petar II Delyan's successes ended, however, with the interference of his cousin Alusian. Alusian, whose father Ivan Vladislav had murdered Peter's father Gavril Radomir in 1015, joined Petar II's ranks as an apparent deserter from the Byzantine court, where he had been disgraced. Alusian was welcomed by Peter II, who gave him an army with which to attack Thessalonica. The siege, however, was raised by the Byzantines, and the army was defeated. Alusian barely escaped and returned to Ostrovo. In 1041, one night during dinner, while Delyan was drunk, Alusian cut off his nose and blinded him with a kitchen knife. Since Alusian was of the blood of Samuel of Bulgaria, he was quickly proclaimed emperor in Petar II's place by his troops, but he conspired to defect to the Byzantines. As the Bulgarian and Byzantine troops were preparing for battle, Alusian deserted to the enemy and headed for Constantinople, where his possessions and lands were restored to him, and he was rewarded with the high court rank of magistros. Meanwhile, though blind, Petar II Delyan resumed command of the Bulgarian forces, but the Byzantine Emperor Michael IV determined to take advantage of the situation and advanced against them. In an obscure battle of Ostrovo, the Byzantines defeated the Bulgarian troops and Petar II Delyan was captured and taken to Constantinople, where he was perhaps executed. According to some legends he was later exiled to a monastery in Iskar Gorge, in the Balkan Mountains, where he died. Norse sagas refer to the participation of the future Norwegian King Harald Hardrada, who allegedly cut down Peter II in the field of battle as a member of the Varangian Guard. This tradition may be supported by a laconic reference in the so-called "Bulgarian Apocryphal Chronicle". In either case, Peter II Delyan might have perished in 1041. Delyan Point on Smith Island in the South Shetland Islands, Antarctica is named after Peter Delyan. ^ Йордан Андреев - "Българските ханове и царе VІІ-ХІV век. Историческо-хронологичен справочник", държавно издателство "Д-р Петър Берон", София, 1988 г. ^ The wars of the Balkan Peninsula: their medieval origins. Alexandru Madgearu, Martin Gordon, Publisher Scarecrow Press, 2008, ISBN 0-8108-5846-0, pp. 63-66. ^ David F. Burg (9 January 2004). A World History of Tax Rebellions: An Encyclopedia of Tax Rebels, Revolts, and Riots from Antiquity to the Present. Taylor & Francis. pp. 74–. ISBN 978-0-203-50089-7. ^ Florin Curta (31 August 2006). Southeastern Europe in the Middle Ages, 500-1250. Cambridge University Press. pp. 283–. ISBN 978-0-521-81539-0. Wikimedia Commons has media related to Peter Delyan.